Are you curious about trying a Poetry Teatime with your family but don’t have the spare time in your jam-packed schedule? Do you feel exhausted even thinking about planning elaborate and Pinterest-worthy feast? Would you like to get back to enjoying the basics of poetry with your family? Then today’s post is for you. Some weeks, you may want to enjoy a teatime without all of the preparation and fuss. But how do you set that time apart and still make it special? Poetry Teatime doesn’t have to take long. It doesn’t have to be fancy. And it definitely doesn’t need to feature themed decorations, food, and drinks (as much as we may enjoy coming up with ideas for celebrations!). 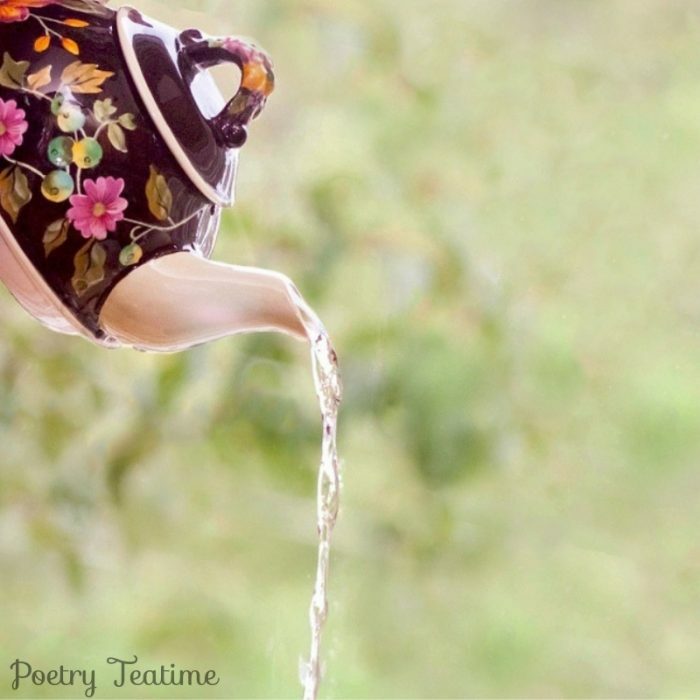 Here are some ideas for a truly fast and easy Poetry Teatime. Your teatime doesn’t have to have an abundance of decorations. Here are some ways to still make it special. Play music: The easiest way to set the scene is to start playing background music. If you’d like something simple and relaxing, check out this video of classical music for reading from Haldon Music on YouTube. You may also enjoy this winter-themed compilation of music from the Chronicles of Narnia by Ambient Worlds. Candlelight ambiance: If you would like to make the teatime space feel different from your everyday setup, light a candle and put it on the table. An electric candle will work too. Easy atmosphere, done. One thing: Have one object that makes your family think of teatime and set that on the table. Maybe it’s a special framed picture that your family loves. Maybe it’s a tablecloth. Maybe a vase of fake flowers. Pick just one thing that’s easy to get out as a reminder that it’s Poetry Teatime. Rotation station: You probably rotate chores and other responsibilities in your family. Why not do that for teatime, too? One person can set out the supplies (cups, plates, juice/snacks) and one person can wash and rinse at the end of the teatime. You don’t have to serve any food or drinks at your Poetry Teatime if you don’t want to. But if you’d still like to have some “tea” with your “teatime,” here are a few ideas. Easy cold drinks: Serve your family’s favorite fruit juice, soda, or a bottle of lemonade. Especially if you don’t normally serve sugary drinks, this may help make teatime special. Plus, it requires almost no prep! Quick hot drinks: Making tea or hot cocoa is one of the simplest things to do for teatime. Set a kettle on the stove or heat up water in the microwave. You can also heat a jug of store-bought apple cider for a different treat. Special treats: Make your teatime special by serving a snack you normally limit in your family, whether it’s a bowl of especially sugary cereal or bread with nutella spread. Other easy snacks: Try simple combos like chips and dip, popcorn, mandarin oranges, or tea biscuits like digestive biscuits or gingersnaps, which you can find at most grocery stores. You can also pick up whatever discounted donuts or cookies available, if you don’t mind all the sugar. For a “poetry” teatime, you may want to read some poetry! Here are some ideas for making the process of choosing poems easier for the whole family. Follow the leader: Rotate one person in the family who will “lead” the teatime each week. The leader chooses 1-2 poetry books to bring to teatime and starts with their favorite poems. Then the rest of the family can read a poem or two from those books. One poem per person: Each person brings one poem that they have already decided on to teatime to share with the family. This cuts down the decision-making time, as long as everyone is able to choose a poem in advance. Random page flip: If you’re really struggling to decide what poems to read, give each person a book and randomly flip it open to a poem. This is definitely a way to keep your teatime interesting, and you may be surprised by what combinations will result! Online poetry lists: If you don’t have any poetry books on hand or you can’t stop by the library this week, choose your poems from a family-friendly list of poems like this one from Poets.org. Above all, do what feels fun and relaxing for your family. Try not to have a mental checklist for the “perfect” teatime, because chances are, life will get in the way. Instead of matching your teatime to a Pinterest-worthy ideal, just focus on having fun together. And enjoy!